Are you an ex customer of Dealspot.com.au ? Ink Hub is supplying many of Dealspot's old customers with the highest quality generic printer cartridges. Are you looking for Dealspots Contact Number ? Dealspot.com.au are no longer in business so please call the friendly team at Ink Hub on 08 7324 3065 to place your ink cartridge order. Alternatively you can use our easy cartridge finder and shop online. 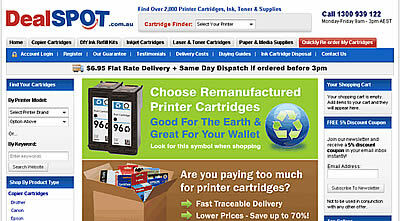 All of our Generic cartridges are shipped Australia Wide Express at a cost of $5-50. All orders over $65-00 are shipped Express FREE OF CHARGE.